I think I would love to experience both balconies... what about you? Please be sure to visit other Outdoor Wednesday participants via A Southern Dreamer ... and stop by tomorrow... I will have another question for you! What a gorgeous painting! Merry Christmas, Fifi! Think I would go for the bright sunny pink balcony. Snowy balconies look good from inside in the warmth. Hello Fifi! Both balconies are so nice! Wish you and your family merry Christmas and a joyful time!!! Yep! Both work for me! Beautifully. French-ly. Having been to Paris in January I think I'll wait for the warmth and sun of spring - that first shot is much more my style :). Have a wonderful holiday Fifi. Oh, I can't decide so I'll take either. Both look so Parisian. On second thought, I saw the snow on the second one with the bike, so the sunny one with the flowers is my favorite. No snow pour moi. Gorgeous duo, darling FF! Love your painting so! Beautiful painting Fifi! So, you stole my skates :-))). You can have any of my pictures....I love it when you do that. Are you painting them? With the bannister and greenery? I enjoy seeing the second one, but I would go for the first one every time! Let the sun shine on this old beach gal any time. Both are lovely, but I LOVE your art! 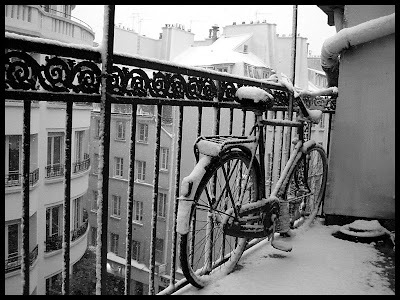 Right now I'd prefer the snowy balcony with a big coat, boots, and a cappucino. Happy Holidays to you and your family Fifi! Beautiful...avec un petit côté Raoul Dufy !! I am so excited to be giving one of your wonderful paintings that I recently purchased to my daughter for Christmas. She will take it to her Paris apartment as she finishes her last semester of University. I know she will love it and probably ask me to commission an entire series of your fun and beautiful work. Hope your holiday is filled with the magic of the season. 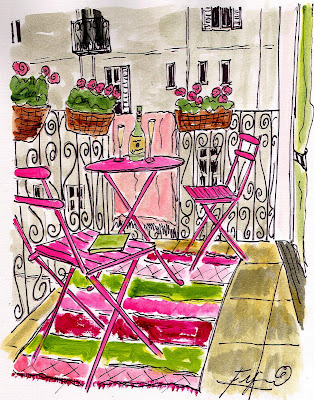 Well, I would certainly like a balcony in Paris during any season, but I do love the one in your painting. The rug is fabulous. I would love to have the snowy balcony for a few days over Christmas and then straight back to the sunny pink one. Beautiful painting Fifi! Hi Fifi thanks for calling into my blog, and thank you for the lovely comment. May your stockings be filled with all the beautiful French things you love. Both balconies are lovely and I would like to look out on either. Have a super merry Christmas with your family, and happy holidays. I like the top one it has GOODIES. Your art work is great. It has a whimsy feel. I would definitely like to experience both balconies! Merry Christmas to you and yours, Fifi! Mmm I'd like to be sitting on one of your pink chairs! Oui Oui! I'd love to experience Paris ANY time of the year! Wishing you a very Merry Christmas Fifi! Both balconies would be great. Have a very Merry Christmas!